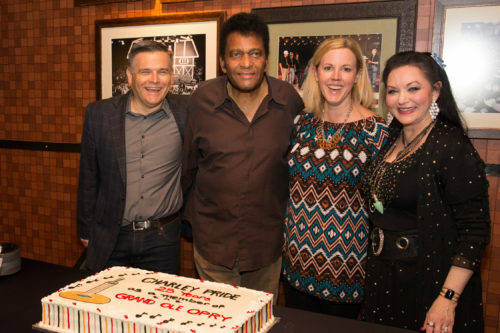 PHOTO RELEASE: Charley Pride Celebrates 25th Opry Member Anniversary | 2911 Enterprises, Inc. Performance – Charley Pride Photo by Rachael Black, courtesy of the Grand Ole Opry. L-R: Dan Rogers – Director Marketing, Communication and Artist Initiatives, Grand Ole Opry, Charley Pride, Gina Keltner – Sr. Talent Manager, Grand Ole Opry and Opry member Crystal Gayle. Photo by Rachael Black, courtesy of the Grand Ole Opry. Charley Pride also recently announced he’ll be performing at the 2018 CMA Fest, on Friday, June 8 at 8:00 pm at Nissan Stadium. Pride will be sharing the stage that evening with a host of other modern country staples including Blake Shelton, Carrie Underwood, and Old Dominion.